Rise early to travel to the base of Uluru. Here you will receive your breakfast, accompanied by your guide, commence your base walk of Uluru as sunrise approaches. First walk from Kuniya Piti, an Uluru sacred site and hear the Tjukurpa (Anangu – the local Aboriginal people - beliefs and law) story of the Mala Men. Next is the Mala Walk, one of the most important habitation areas for the local Aboriginal people over thousands of years. The Mala walk includes a visit into Kantju Gorge, where after rainfall, water can cascade over the side of Uluru and plunge some 90-metres. From here, you are then on to the base of the climb point. After a short rest break, continue on along the Lungkata Walk where your guide will tell you the Tjukurpa story of the cheeky Blue Tongue Lizard! Next stop is the Mutitjulu Waterhole. Your guide will indicate the natural features of the landscape, Aboriginal rock paintings and relay more traditional stories relating to this special place. The waterhole was once an important water source for the Anangu people. Your last section to complete your base walk is back to Kuniya Piti where you will board your coach back into town and receive a certificate of your achievement! Please ensure you have a minimum of 1.5 litres of water with you for your walk. Bus arrived on time and full explanation was given. Our guide TJ and driver Dan were friendly and helpful. The trip was extremely well organised and TJ was very knowledgable. Little things made it extra special like the tea coffe and buscuits along with the breakfast half way. The ice cold towels at the finish were very welcome! Altogether an unforgettable experience and well worth the money. The tour was well organized and able to handle a diverse group of people. The walk was well paced and Emma had a wealth of knowledge on the culture and beliefs of the local people as well as natural aspects. The unusual and rare rainstorm only added to the experience! If we are fortunate to return in the future this will be on the agenda! Wonderful day, our guide Gary was great. This tour was excellent and a 'must do' whist visiting the Rock. The hotel pick up was on time, and the first stop was to the Sunrise viewing area for breakfast everyone provided with a breakfast bag to see the silhouette of the Rock. The group then moved to the rock to start the base walk. The guide was informative and the group were able to walk at their own pace. The Rock is such a site to see close up at different angles. Had an amazing morning on the sunrise and base walk tour! You get up really early to avoid the heat later in the day and to get to Uluru way before sunset so you can appreciate the wonderful change of color over the rock. At the time of the actual sunset you're already at the base of Uluru so you get to see the bright red rock up close. 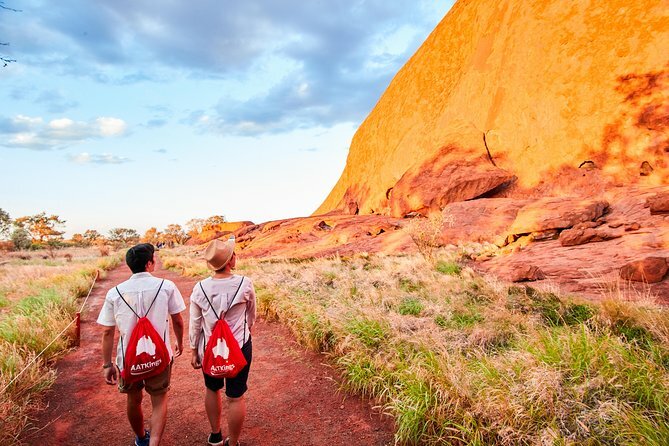 During the walk you learn a lot about the aboriginal people - how they lived around Uluru, their culture and beliefs as well as the formation of Uluru and the nature surrounding it. There are lots of things to see that you can't really appreciate from afar so this longer base walk is well worth it! Our guide was funny, very knowledgeable, always made sure we're all comfortable and drinking enough water and took excellent photos of us! Make sure to bring enough water, sunscreen and a hat. You make a stop in the middle so you can refill your water bottle or even stop walking if you had enough. The pace of the walk is pleasant and except for the last hour of the walk there is always some shade provided by the trees. I was amazed by how beautiful and peaceful Uluru is from up close - it's an unique experience that I would highly recommend! This isn't so much a tour as an experience. It requires a very early start to beat the heat. Picked up from my hotel in Ayres Rock Resort at 5.00am. There were 12 in our group. Headed to the Uluru-Kata Tjuta National Park, to first have breakfast at one of the coach designated stopping areas. Still dark when we had breakfast, which was a selection of cereals, milk, fruit cups, granola bars, pastries, coffee and tea. They had to set up lights for us to see. JUst as there was a hint of light with the sun beginning to rise, we drove to the coach parking area and prepared for our 9.4Km walk. We were already walking when the sun came up. I took the time to stop periodically to look behind as the sun rose, to see the beautiful sky. The sun at different times bathed Uluru in splendid light and colors. Quite spectacular. Because it was the beginning of February, it can get very hot, so it's important to be prepared with having plenty of water, sunscreen, a hat and sensible walking shoes. The walking path is flat. Our guide was an Aborigini who gave us a great deal of information and history. We stopped at different stages so he could explain and direct our attention to several important sights around Uluru. There are some rock overhangs, almost cave like, where there are ancient drawings on the rock walls. At the half way point, 8 or our group did not want to continue all the way due to the heat. He phoned the coach driver, who arrived to pick up these visitors, take them to the Cultural Center instead of finishing the entire circuit, which does take about 3 hours with the stops. The 4 of us who finished were quite relieved at the end as the temperatures by that time were getting uncomfortably hot. At the end of our walk, we could see the rail which is set into Uluru for those who wish to climb to the top. The Aboriginis consider it disrectful to climb and really I don't know why anyone wants to do it. There are no actual steps, it is somewhat slippery and for those who may fall, the cost of rescue is entirely theirs. Altogether a wonderful experience. We were back at the resort by midday, after stopping briefly at one of the Uluru viewing areas for the opportunity to take some photos. Keep in mind this particular tour is not organized to stop and watch the sunrise before the walk, you are already doing the walk when the sun comes up. Up at 5am but the promise of a hot drink at the sunrise lookout made up for it. the views were stunning and never to be forgot on remember to take warm layers as by the time you've finished the tour you'll be baking hot! The guided walk was both enjoyable and informative and we were able to walk at our pace which was a good pace for the group - Tyson our guide kept us going with lots of stories information and encouragement. It is definitely a must see. Very friendly tour guide and interesting stories. It is along a 12 km path but no hills, very comfortable walking experience. It brought me very different feelings of Uluru. Seeing from a lookout or TV is totally different from seeing and even touching the real rock. Strongly recommended! The start of the walk is one of the amazing starts to a hike I have ever had. You get to experience sunrise over the desert. It is beyond spectacular! This is followed by brightly lit and glowing monolith sparkling in front of your eyes. If you are not paying attention, you may miss it. Every crack, caves and water pools has stories and legends behind it. There are also ancient indigenous arts, stories and rules that truly makes this hike a unique experience. A good level of fitness is required for this tour. This tour finishes at approximately 1300 and therefore it may not return to Ayers Rock Resort in time to meet airport transfers and flights on this day.